Showing the way: Rajat and Jayant Agarwalla, the developers who pioneered the trend of creating applications for Facebook in India. Kolkata’s Agarwalla brothers, whose Scrabulous offering for Facebook has 1.5 million registered users, are not the only Indian developers to have realized the potential of the popular social networking site. Other developers across the country have also woken up to the potential of Facebook, which helps people network and communicate with friends, family, colleagues and casual acquaintances, and which attracts a daily traffic of 54 million people. “A combination of money and the fact that people from smaller towns in India see this as an opportunity to create a new profession and be able to work out of home, will see a substantial increase (in the number) of Indian developers," said Sanjay Tiwari, head of research at JuxtConsult, an online research firm. “Independent developers can build their advertisement revenue by placing ads on their applications and working with companies such as RockYou, Cubix, VideoEgg, Social Media and FbExchange," said a Facebook spokesperson. All the firms have ad distribution networks within Facebook. In August, according to data provided by Facebook, India ranked ninth on a list of 55 countries with the most active Facebook users with an active user base of more than 200,000. Facebook, the Palo Alto, California-based social utility tool launched in February 2004, is still a very new concept in India. It offers users more than 8,000 unique applications. Out of this, only around 230 have been developed by Facebook’s own staff, while the remaining have been created by independent developers. WineWeb, which launched two-three months back on Facebook, is a directory of more than 30,000 wineries and more than 100,000 wines across the world—people can search the directory online, write reviews and create a wish list of wines. WineWeb currently has around 17 active users. Rajeesh is already working on his next application, Video Gift, which he plans to launch by the end of the year. “The Web 2.0 technology allows channelizations and display of one’s wares. Social utility tools like Facebook will lead to more atomization, specialization and classification of your work. This will create further showcase and monetization opportunities for Indian developers in large global platforms like Facebook," said T.S. Mohan Krishnan, vice-president and country manager at Bird, the technology consultancy arm at research firm IMRB International. Another developer, a 26-year-old Bangalore-based software engineer who did not wish to be identified because of non-disclosure agreements with the companies for whom he is developing applications, says it is the thrill of “being known" and “money" that drove him to create applications for Facebook. He is currently working on creating applications that poker players can use. “I want to earn a name for myself and have my own start-up firm in the future. Facebook is a platform that allows me to leave a bunch of work behind me. It is viral, instantly acceptable and ensures that if you are doing something good, the world will see it and use it," says this developer. He makes between $10 and $15 dollars an hour and, like Rajeesh, has a day job—he works for a local Internet company. 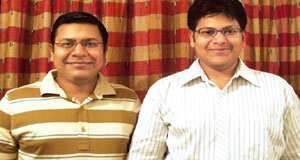 The developers who really pioneered the trend of creating applications for Facebook in India are Rajat Agarwalla, 26, and his brother Jayant, 21. “The Facebook platform is nothing short of a revolution in the social networking scenario. It has enabled thousands of developers to get instant access to a varied user base to promote their applications, make money, or simply show off our skills as developers," the self-employed brothers wrote in a mail. The duo did not comment on their earnings, but said they make enough from advertising to cover costs. Scrabulous adds about 15,000 users a day, claim the brothers. They are already working on their next application, which they want to keep “under wraps as we want to pleasantly surprise our users".